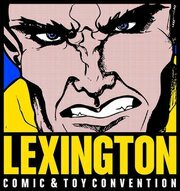 A new convention joins the ever-growing list of fan cons, Lexington Comic & Toy Con at the Lexington Convention Center in Downtown Lexington, Kentucky on March 24. Craig Boldman known for his work on Archie comics; Molly Durst creator of the graphic novel series Symphony of the Universe; Mike Grell creator of Warlord and known for his Green Arrow work; Mark Kidwell co-creator and writer of the zombie epic 68; Jay Leisten currently working on X-Men Legacy and Uncanny X-Men; Bob McLeod co-creator of the New Mutants; Jamie Snell sketch card and cover artist; Tom Williams created the graphic novel No Dead Time; RD Hall writer of American Wasteland: Blood and Diesel; and Allen Bellman legendary artist of Timely comics. Drew Curtis who runs Fark.com; pin-up artist Uko Smith; Katie Doyle of MTV’s Road Rules; Jonny Fairplay Surivior castaway turned wrestler; voice actor Neil Kaplan from such shows as Digimon, Bleach and Transformers: Robots in Disguise; Mark Ryan the voice of Bumblebee in the Transformers movies; legendary WWE Diva Tammy Sytch; and Dean Lorey producer of Arrested Development and other shows. The con has gathered a number of former Power Rangers for the con such as Jason David Frank (MMPR Green and White, Red Zeo, Red Turbo, and Black Dino Thunder), Catherine Sutherland (MMPR, Zeo, and Turbo pink ranger), Nakia Burrise (Zeo and Turbo yellow ranger), Paul Schrier (Bulk), and Jason Narvy (Skull). Kenn Minter of Near Mint Press; Jenny Stead of Ninja’d; Tim Tyler currently working on the comic Shadow Planet; Wes Hillegas of the horror comic Man Made Monster; Cristy Clemans debuting her creation Ninja Pea at the con; Dustin Carson of the limited-series No Gods; Mary E. Bartley of Nox Prophecy; Cindy Ramey of Nightshift and Nox Prophecy; Terence Hanely of the comic Lucky Girl and alien and monster coloring books; Rodney Fyke small press comic creator like PP’n'J; Brett Hatfield sketch card artist with his frist comic Mimics; Todd Beistel of Yuri – Gypsy Hunter; and Martheus Wade of Tales of the Toshigawa. Small comic publishers Action Lab Entertainment, Ringtail Cafe, Monument Comics, Old World Comics, and book publisher Post Mortem Press. The podcasters of Beaucoup Pop; Leon Rigsby who owns one of the top Minecraft servers in the world; independent film company ZP International Productions; Amanda Dyar model, writer, and editor of Bio Gamer Girl; actress Kayla Perkins; Bertena Varney a vampire sociologist and author of Lure of the Vampire: A Pop Culture Reference Book; Nic Brown author of the Werewolf for Hire series; John Berry writer of Dark Arrival; pixel artist Mike Eshelman; the Comicbook Jerk Aaron Gabbard; the costume organization Mandalorian Mercs; Annie Erskine who does graphic design for Cartoon Network; and Natasha Collier founder of Kentucky Geek Girl blog. Rolling Video Games will be there with widescreen TVs and several different games to be played alone or in teams. The online toy store Jetts Toy Hutt will be running hourly give-aways of toys, shirts, and more and just hang out with fans instead of selling this time. The vendors mostly consist of various comic and toy dealers. Bringing vintage and new of both. One of them, Red Viking Emporium, will be holding special drawings during the con. The con will be from 10am till 5pm. Tickets for the con are still available for only $8, $10 at the door, or you can buy a VIP pass for $20, $25 at the door if any left. Children under 10 get in free. The con looks to be very exciting and big one of comic book and Power Ranger fans. Very much of a collectors con, but I am cool with that. Check out the con at their site and follow them on social media for any last-minute guest adds and other updates. The Crowne Plaza Lexington – The Campbellhouse (Less than a mile from convention center) is offering a negotiated rate of $95.00 dollars a night for attendees. Just call 859-255-4281 and use code COM for your reservation. See you at the convention!